“We should be getting close,” Meghan promised, pointing at the trickle of hot water meting our icy path. She’d been saying this for 45 minutes, up hills and through knee-high snow drifts. I’d unzipped my coat, the bitter temperature soothing my sweaty, tired torso. When everything is buried in 12 inches of white, “close” becomes an optical illusion. The route to St. Leon hot springs follows the bed of a gravel road (in summer) or diverts through a valley. 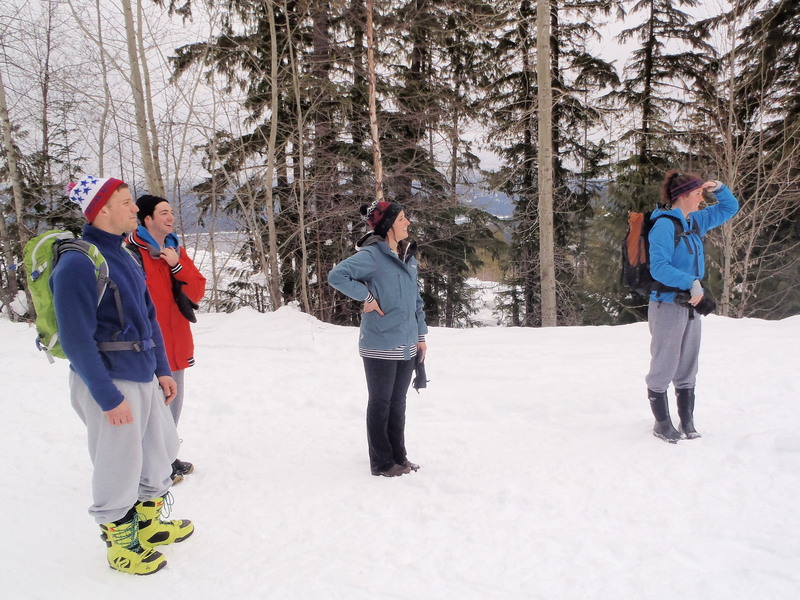 We took an unexpected detour, falling into unpacked snow banks and tripping over hidden tree roots. Reaching the St. Leon hot springs requires a minor expedition. Located on private land near Nakusp, British Columbia, the sulfurous pools are dug into a mountainside some 7 kilometers from an unpaved, neigh-invisible turnoff. 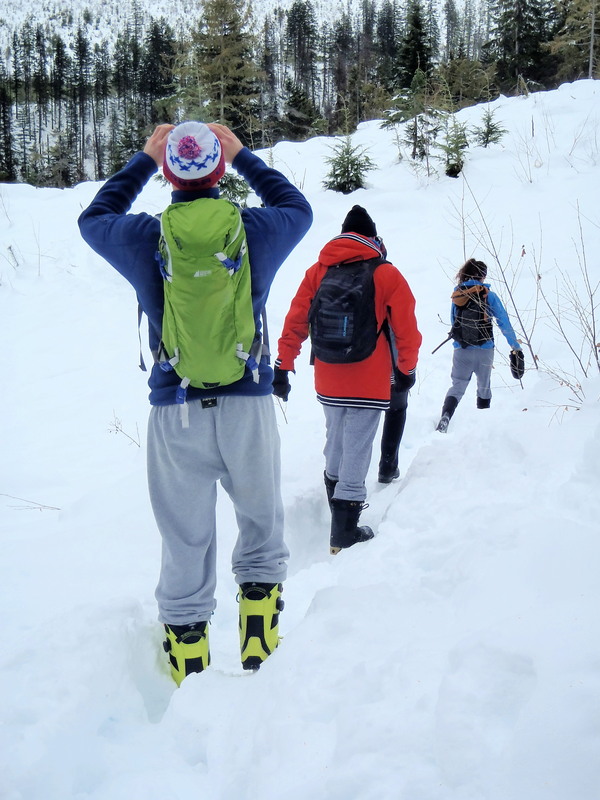 “It’s only about 14 miles,” Meghan assured me, after we’d strapped on snowboarding boots and camelbacks, and crunched our way up the snowmobile path. Luckily, her numbers were exaggerated. 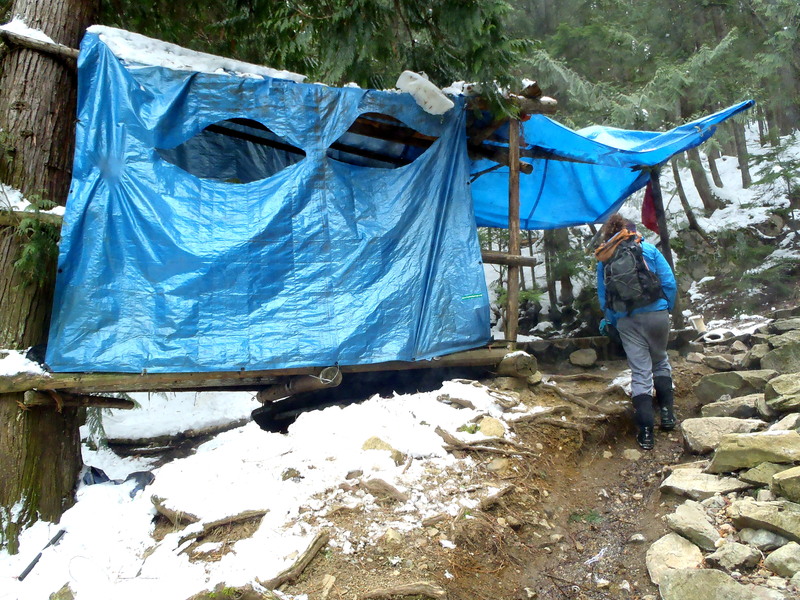 After a frigid but fast 40 minute hike – “Look for the blue tarp,” Meghan instructed – we stumbled upon a temporary lean-to dressing room of tarpaulin and pine branches. There’s little room for modesty at the St. Leon hot springs. Rumors abound of run-ins with local bathers, glad to soak in their birthday suits. Though there are several natural hot pools in the area, St. Leon is the only haunt open to visitors, for free. Layered rock tubs, fed from the spring via black rubber tubing, help St. Leon retain its untouched setting. Those who do make the trek arrive prepared, with candles, sandwiches, wine, headlamps, water bottles and dry towels. Someone had carved out floating wooden buckets to hold our hot chocolate and lessen our freezing flights between hot pools and lean-to. Meghan from an upper pool down to her belongings at the largest, and more temperate, base pool. This resolution is harder than it looks. While anyone who has ever worked a 40-hour week can recognize how quickly stress builds up, the duress of long-term travel often goes unreported. You might not be dealing with idiotic coworkers or a demanding boss; but, skillfully bartering for a cross-town tuk tuk, or trying to find a hostel after 30 hours in a vintage bus, are situations just as likely to cause migraines. In either environment, it’s up to us to let off some steam. “Isn’t this worth it?” Meghan asks. 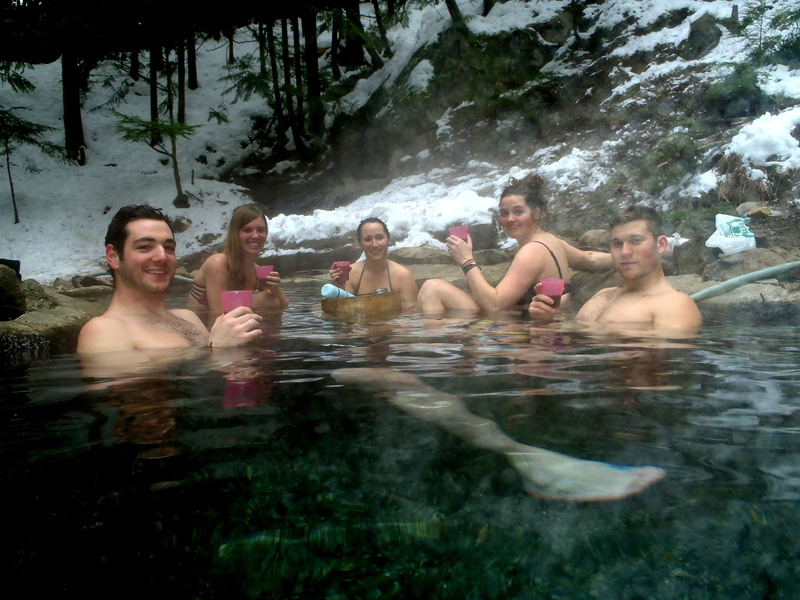 Patrick, Me, Adry, Meghan and Jordan revel in St. Leon’s relaxing hot springs. That looks so relaxing. I don’t know if I would want to leave. Thanks, Jose. I assure you, it was pretty hard for us to leave, too! I always try to laugh at problems and annoyances, or unwanted individuals. I consider most of misadventures to be actual adventures. Be less stressed for sure! Very nice parallels. Nicely composed blogpost! Thanks Rommel, such a wonderful mentality! I’m sure that makes you a better traveler – your attitude is the best possible ‘passport’ you can carry. Definitely something I need to remind myself to do – RELAX! And the best place to do that is at a big, beautiful log cabin in the Black Hills… ; ) Wish I could have seen you and Mark while you were out visiting!